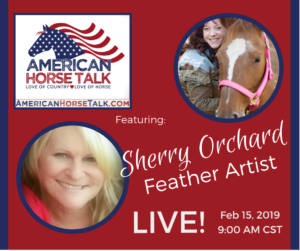 Watch Sherry Orchard tell her horse story on American Horse Talk LIVE on March 1, 2019, at 8:00 AM Central. Sherry is a feather artist and creates beautiful paintings on feathers! Don’t miss this one! To comment live, watch from the American Horse Talk Facebook PAGE. To join us on camera, download the BeLive.tv app. See YOU online!